Didn't have a great sleep last night - we had extra chocolate left over so we ate it all and I think that may have kept me awake for a bit! This morning we woke to a very windy morning so we had brekky in the tent ... the wind was very cold and is probably the strongest it has been for this leg of the trip! We had this wind behind us for the first 12km and then we get to 3 ways ... do we turn left and head home or do we turn right and have a crack at going all the way round? 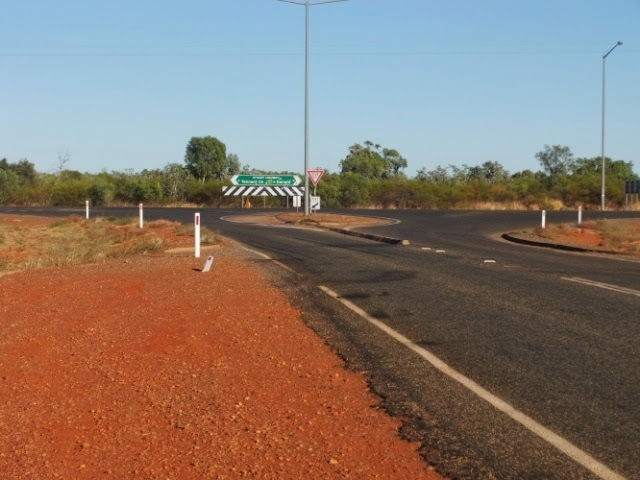 I think you guessed that we turned left as the title of this post has Tennant Creek in it! So you could say officially we are now heading in the direction of home ... hoping we don't drop south too quickly as there is alot of cold weather down there - Alice Springs is only 15 degrees at the moment!!! Here in Tennant Creek is around 22 degrees but it feels colder because of the wind. So once we turned left we were heading straight into the wind until Tennant Creek, at least the first 10km it felt straight into the wind and then the road curves a bit and it becomes a cross wind around 30km per hour and I tell you I have no food in the panniers except for a few crackers, biscuits, a small piece of processed cheese, a little jam and honey and believe it or not NO WEETBIX! OMG I have never been without weetbix! Traffic both ways were struggling with the strong cross winds - I kept getting blown into the middle of the lane and vans going in the opposite direction were getting battered a round a bit! A few road trains with cattle over took us and I was fearing the gusts would blow me into their path! But we got here in the end. We are in the caravan park that is the first one as you approach from the north as it is the cheaper. It is an okay park and has a reasonable kitchen - bbq, toaster, jug, microwave, fridge and sink so all we need really. Tonight we are having Porterhouse steak, while at Barkly Homestead I smelt someone cooking meat on their bbq and I got a craving, I suppose after 10 days of pasta meals, tetra pack chicken meals and weetbix the urge for fresh food hit me so I said to Neil when in Tennant Creek lets splash out and get some steak ... so he comes back from the IGA with 6 pieces of Porterhouse steak at $10 per kilo. I suppose we were so enthusiastic about having steak we didn't stop to think that we don't have forks and knives with us to eat the steaks! we only have a spoon each so we will have to cut up the steak with our vege knife and eat with our hands ... won't that be a good look! Even Kouta is having Porterhouse steak tonight as it is cheaper to feed him that than by him a small My Dog meal!!! Neil has been into town and since we were last here it is a town that has died, not too many shops and if anything there are more closed than open, he also said he has never seen so many Aboriginal people in his life they are congregating out all on the streets. So tomorrow it is my turn to have a look around and do the shopping, what I really need is a haircut but since it is a Saturday I doubt if I could get in and I am not even sure if there is one! We will be here tomorrow and will more than likely stay Sunday as well - at least the IGA is open on the Sunday!